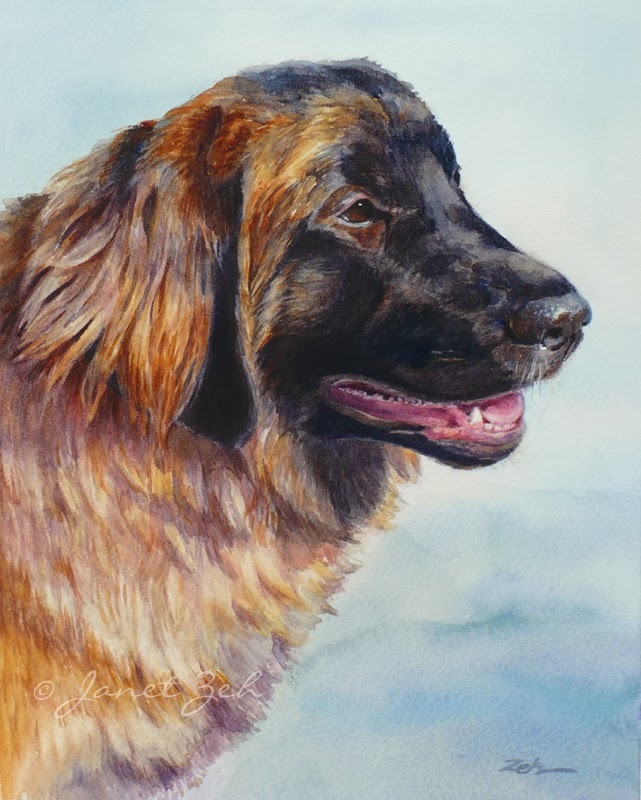 Have you ever heard of Leonbergers (working mountain dogs from Germany)? I had not until I met Zoey. She is gorgeous - a very big dog with a sweet personality, golden brown coat and a black mask on her face. This commission was especially nice because it is local. I could meet her, pet her and take dozens of photos. I chose a pose that shows the twinkle in her eye and her beautiful profile. 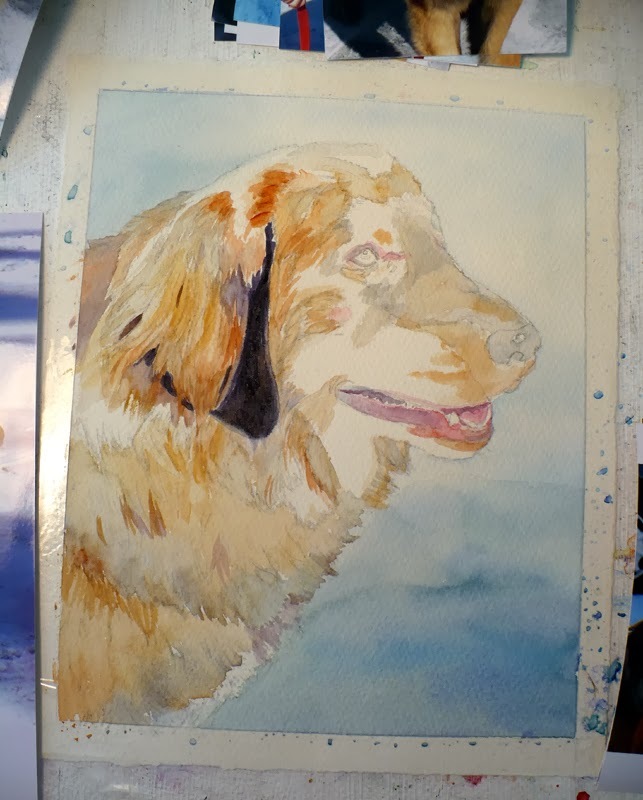 Read on if you'd like to see how I painted Zoey. 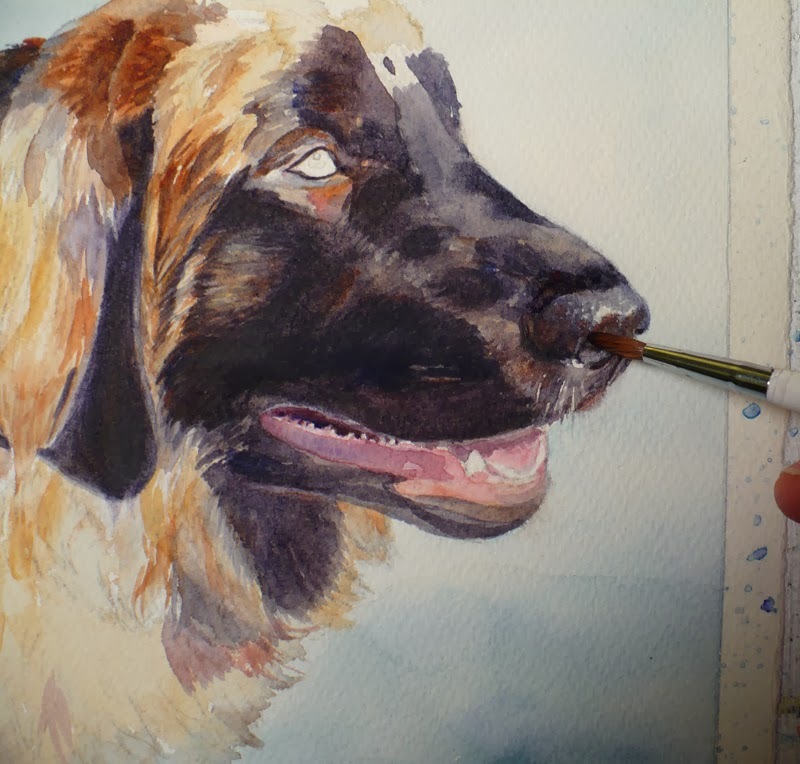 Or you can skip to the finished portrait by clicking here: Leonberger Dog Portrait. The first thing I do is a wash of color for the background. Pale blue will show off her colors well and gives the feeling of a winter background. After the background I paint her lighter golden tones leaving the darkest areas for now. 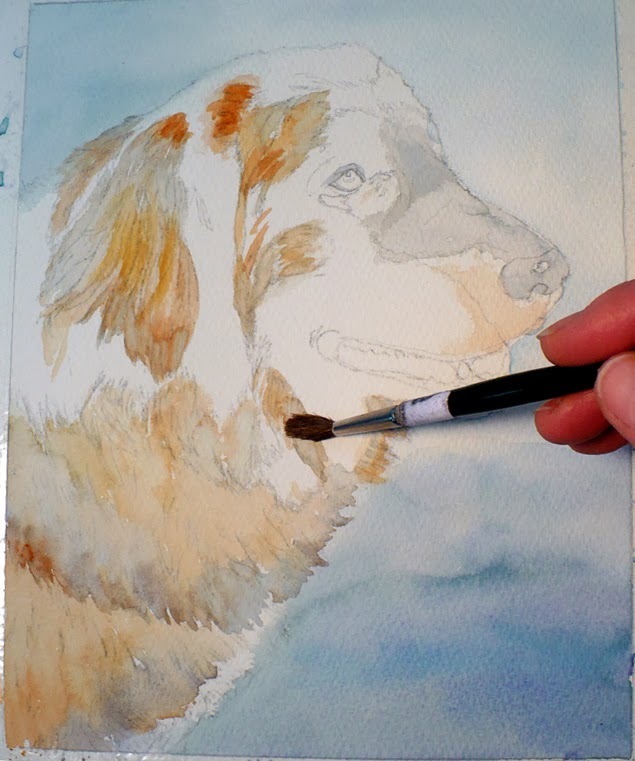 With watercolor, it works best for me to paint the light colors first, then the mid-tones, and last the dark. 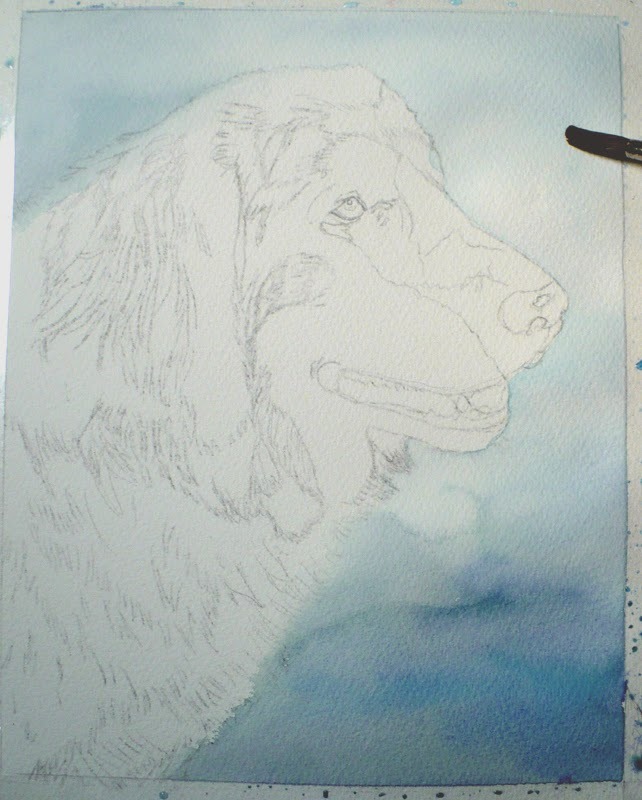 Below, I've begun to add black - so far just her velvety ear. Leonbergers have a double coat of fur and it's very obvious on the ears - black underneath and fluffy golden fur above. The double coat must keep her very warm in the frigid, snowy weather we've been having here. The details come next and these take time to paint. I didn't realize it until just now, but in the picture below it looks like I'm sticking a paintbrush up her nose. Ouch, poor Zoey! Finally, after working for a long time with the fine details of fur, eyes, nose and mouth, the painting is finished! You can click the images to see them a bit larger. Doesn't Zoey have a happy look on her face? I think she's ready for a romp in the snow. 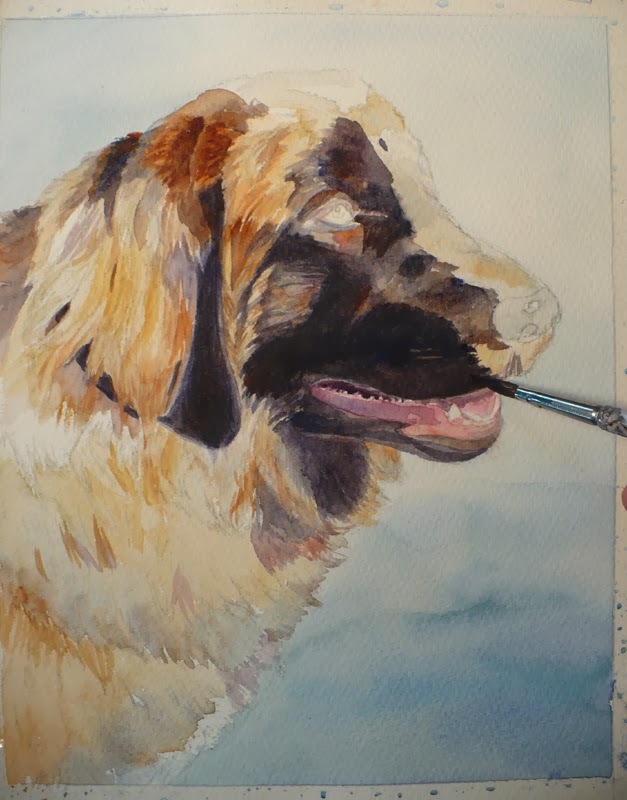 Do you have a pet you'd like painted? Check out the details here, ZehPetPortraits.com or contact me.